Have you always wanted to play paintball but have been told you’re too young? Fear not, Delta Force Paintball is here to help with the launch of MiniBall, a customised paintball game suitable for participants as young as 8 years old. Due to state laws governing the determination and use of a firearm, young people in both the Australian Capital Territory and Victoria were left only to watch on as their older friends and siblings enjoyed the fast paced, quickly developing sport of paintball. MiniBall has been specifically designed as a safe but still exciting alternative to the standard compressed air charged paintball game, incorporating the latest in paintball technology with custom-designed pump action paintball guns using a powerful spring mechanism that propels the MiniBalls with surprising effect. MiniBall players get to play on the same full sized fields of play (with smaller paintball equipment) and under professional supervision with specific rules of engagement designed for their fun, safety and enjoyment. They are kitted out with full protective paintball combat gear so they are not only safe but enjoy the full spectrum of the paintball game. 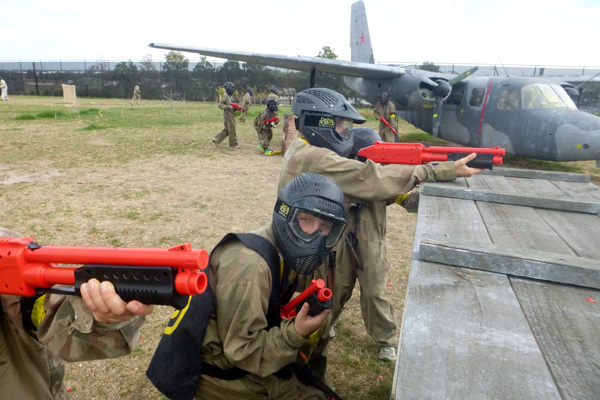 Full and half day events are available, meaning MiniBall paintball games are set to be extremely popular for kids birthday parties, school excursions, sporting break-ups, team-building events and fun days out. Armoured Gloves and Groin Protection are also available for a small fee and are yours to keep. Drinks and chocolates are available at the kiosk. Lockers are available for hire. MiniBall is available and Delta Force Dingley and Delta Force Canberra. During a MiniBall event full supervision, encouragement and direction will be provided by our fully qualified marshalling teams, meaning parents have the option of participating with the youngsters or sitting back and watching the fun unfold. Parents be warned – if you dare to accept the challenge and battle it out against the youngsters you will be larger targets out in the heat of battle. Never again be told you’re too young to play paintball – MiniBall with Delta Force means people of all ages can enjoy a day of paintball adventure. Game details vary by location – browse our locations here or call 1300 850 744 for specific details about your selected location and ask about MiniBall. Alternatively, check out www.miniball.com.au for more details.